Are your file systems filled with documents that no one reads? You need a knowledge management strategy. That’s because all companies, over time, produce a lot of stuff. Policy documents, guidelines, assets – these are important pieces of content, but they have a tendency to multiply and duplicate. With different versions of the same document spread across personal computers, cloud storage and emails – it’s no wonder we can’t find what we need. The solution: you need a knowledge management strategy. What is a knowledge management strategy? The end goal of all knowledge management is a state of organised nirvana: where anything an employee might need to know is easily accessible and said employee knows how to find it. A knowledge management strategy is your plan to get there. This can take different forms. At some companies, it’s a case of moving their content onto an intranet with a solid knowledge base. At bigger companies, it means hiring a full-time knowledge management team to manage your intranet, knowledge base and other communication tools. Most companies are brimming with information and policy documents – a lot of which needs to go. So, first things first, you need to take stock of what you already have: a full audit of the content you have and the tools its spread across. Performing a full content audit involves sifting through your documents, working out what you have and beginning to organise everything. First, create a spreadsheet. 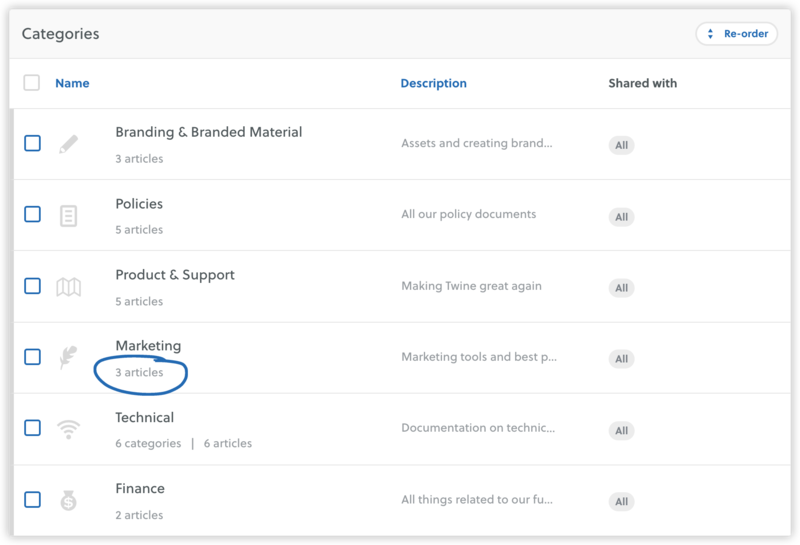 Then, create a list of top-level categories for your content. This is will form the basis of your knowledge base. Don’t worry about setting anything in stone – you’ll inevitably chop, change and add categories as you go. It’s really up to you to decide what’s best for your business. Now, you’ll need to find the right place to share your content. Repeat the steps above and audit the communications apps in use across your entire business. Your job here has two parts. First, to assess which of your existing channels are the best for sharing knowledge. Second, find what your current toolset is missing. You’ll notice our setup doesn’t include email – that’s because, unlike most businesses, we use this for external communication only. We keep all of our internal content in a neatly integrated loop centred around Twine. Top tip: check in with your accounts team to get an accurate picture of services you’re paying for. These days, businesses subscribe to a complicated web of services. You never know what content is locked away in those forgotten channels. Sometimes, you’ll even stumble across a tool that’s better suited for your KM strategy than the ones in primary use. Now, we can start strategising. There’s no need to worry about things like codification and personalisation. 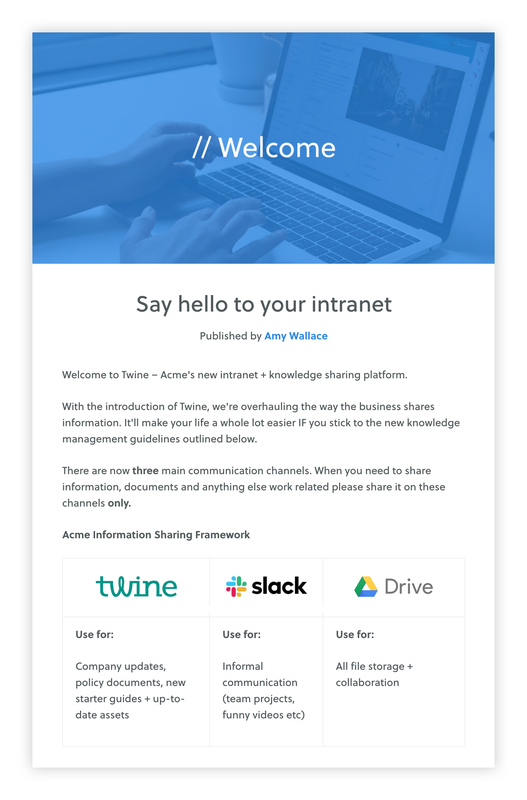 We’ve helped a lot of companies with their knowledge management here at Twine, and we’ve learnt its best to leave the jargon at the door and keep things simple. At small businesses with 25 employees or less, it’s best to keep things simple by basing your knowledge management strategy on a simple knowledge base. That’s because these are easy to set up and maintain when you share responsibilities between team leaders. I would know because I’m one of those people here at Twine. You can see how small we keep our knowledge base below. The content is lean and super focused – which makes our jobs easier and encourages us to keep everything up to date. At businesses with 25+ employees, requirements become strict. You’re going to have a lot more content and tools to keep an eye on, which means you’ll need to automate your job as much as possible. We have a promotional brochure we like to send to new users. But, as we’re always changing the product, this document needs to be updated all the time. To avoid our reps filling their computers with out-of-date documents (and sending them to potential customers) we’ve made a ‘single source of truth’: one place they’re guaranteed to find the right doc. It lives on our knowledge base which we’ve synced with our Google Drive. Whenever I make changes to the brochure, I overwrite the previous version, and the new one is automatically beamed to all our rep’s Twine accounts. Knowledge managers – this person will set the knowledge management strategy, act as editor-in-chief of your knowledge base and procure new tools when needed. Content creators – these people take company information and put it into easily understandable language. Before we can put your knowledge management plan in action, we’ll need to let everyone know what to do. Obviously, there’s only one to do that: an announcement using Twine. It’s simple and covers the core of our strategy: connecting people, news and knowledge together. It really depends on how creative you want to get. The goal of this article was to guide you through a simple knowledge management strategy. You might have noticed that, throughout the article, we talk about one tool that’ll help you do this: Twine. Twine is an application designed so that anyone, at any company, can get a grip on their knowledge management. 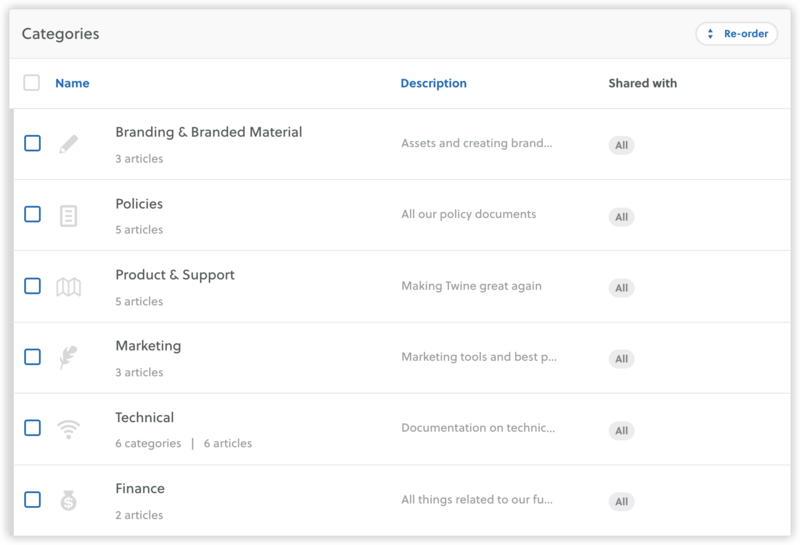 Whether you’re a professional knowledge manager or someone who fits it in when they can, Twine helps you manage and share internal content. Try it for yourself, just head to signup.twineapp.com and set up your trial account.